: Board Collector: MARTY MC FLY!! 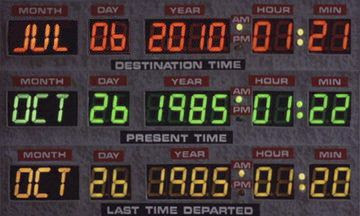 Today is the day that Marty McFly arrives from 1985 after hitting 88mph in the pimped out Delorean. I wish he had a freshly shaped twin fin on the roof racks for me. Marty actually travels to 2015, after briefly setting the date at 2010. 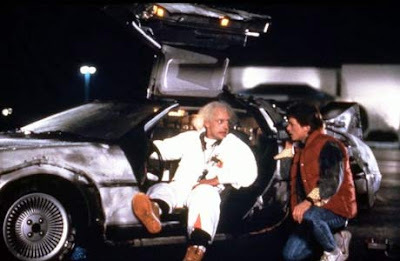 Its 5 more years till we get hover boards. I hate to burst the bubble but Marty actually went to 2015. On the bright side that means we ony have 5 more years to wait for our hover boards. I actually rode a homemade hoverboard! The physics teacher at my school made one from a big plywood disk, fabric with well-engineered vent holes, and a leafblower! You're supposed to ride it sitting down, but I rose from a pig-dog position. It was AWESOME till my chin hit the ground and drove my top teeth thru my bottom lip! It cost me 2 weeks out of the ocean, but it was fun while it lasted!